LOVE BUMPER STICKER WALL ART home decor, jewelry, decor, decorations, electronics, fountains, floor mats, art glass, vases, garden essentials, fireplace screens. 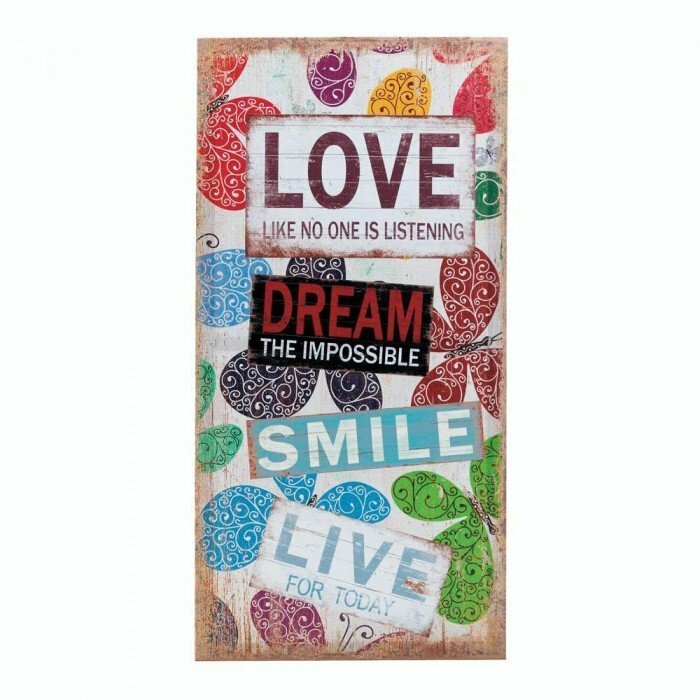 Decorate your wall with whimsy and love simply by hanging this charming canvas wall art. The background of this piece of art looks like a timeworn wooden wall decorated with pretty butterflies, and it looks as if bumper stickers have been placed among them! The words read, "Love like no one is listening, dream the impossible, smile, and live for today". Material(s): CANVAS WOOD - FIR. Weight 1 pound. Dimensions 15.8" x 1" x 31.5".